“We are still finalising whether Ireland will be a stop,” Sarah Sanders said tonight. DONALD TRUMP’S PLANNED trip to Ireland has been cancelled, following conflicting reports that it had been postponed earlier this evening. The President indicated late last month that he would visit Ireland on a trip to Europe coinciding with Armistice Day on 11 November. But this evening, reports emerged that the White House has confirmed to the Irish ambassador in the US that the trip has been cancelled “for scheduling reasons”. We can confirm that the proposed visit of the US President is postponed. The US side has cited scheduling reasons. Following the Government’s announcement, a statement from White House spokesperson Sarah Sanders indicated that the trip may still have gone ahead. “The President will travel to Paris in November as previously announced,” she said. We are still finalising whether Ireland will be a stop on that trip. As details are confirmed we will let you know. 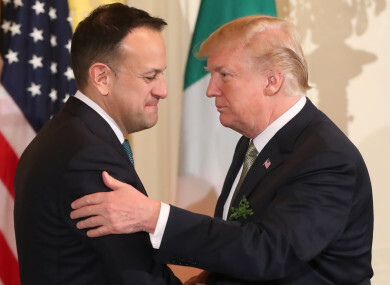 Taoiseach Leo Varadkar has previously indicated that there is always an open invitation for a serving US President to visit the country. This visit – if it goes ahead – would come swiftly on the back of hotly-contested US mid-term elections in November, when the faith of the electorate in Trump’s presidency will be put to the test. The US President had been due to visit Dublin and his hotel in Doonbeg, Co Clare, on Monday 12 November. Protests had been planned for during Trump’s visit, with the large balloon depicting him as an infant set to be transported from the UK for a demonstration. Varadkar said last week that the news that the US President would be visiting “came out of the blue”. Both the Labour Party and the Green Party, who opposed the visit, earlier welcomed the news of the apparent cancellation. Leader Eamon Ryan said: “The visit came out of the blue and has now been cancelled in the same erratic way. We are glad he is not coming. It’s hard to know why the trip has been cancelled at this stage, but we are nonetheless glad that such a costly, potentially divisive and undignified event will now not take place. Email “US President Donald Trump's planned visit to Ireland has been cancelled”. Feedback on “US President Donald Trump's planned visit to Ireland has been cancelled”.